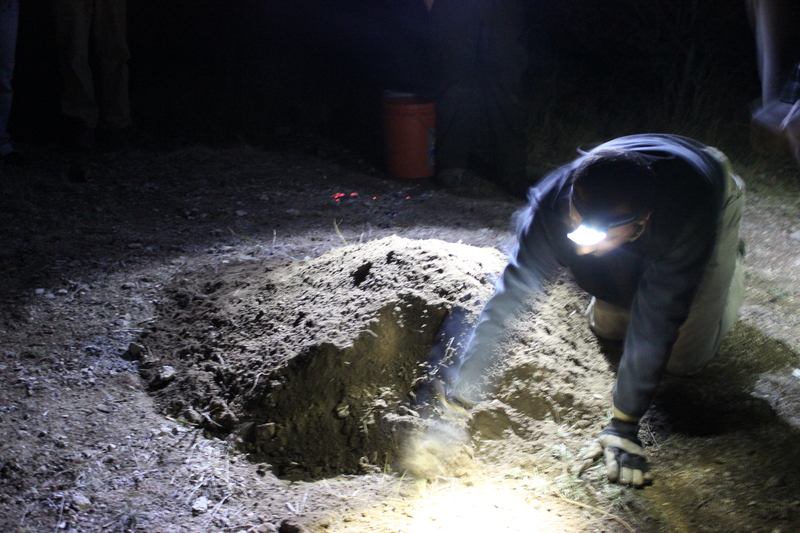 Last year during the 2014 Eagle Nest Canyon Expedition, the crew surveyed the land around the Shumla campus for a fresh spot to establish an experimental earth oven facility. As described by Jake Sullivan and Brooke Bonorden (see Searching for the Trifecta), earth ovens are a cooking technology used by the people of the Lower Pecos (and across the world) to bake plants and animals that would otherwise be inedible to humans. The remains of earth ovens are found at thousands of archaeological sites across the Lower Pecos Canyonlands region, including Eagle Nest Canyon. At Eagle Cave, the massive heep of earth oven cooking debris–mainly fire-cracked rock (FCR)–has accumulated from the repeated use of the site for constructing earth ovens, probably over thousands of years. Though highly recognizable and important to our understanding of the human occupation and use of Eagle Cave, the many hundreds of tons of burned rock that fill this and other rockshelters within Eagle Nest Canyon has been poorly studied and documented by archaeologists who have worked here over the past 80 years. In reaction to this negligence towards FCR and earth oven research, the ASWT project has made it a priority to study and quantify the amount of earth oven cooking that occurred in the uplands and rockshelters in and around Eagle Nest Canyon. As we documented in 2011-2012, similar evidence can be found along Dead Man’s Creek, a tributary of the Devils River, and across the region and beyond. When studying earth ovens, one of the best ways to become acquainted with the methods of earth oven technology is to use experimental archaeology and actually build one! Back in 2014 when we were surveying the Shumla campus for a suitable spot to build earth ovens, we had three criteria to keep in mind while looking for the perfect location: 1. Soil, 2. Fuel, and 3. Food. Not to mention, we took care to avoid establishing an oven at a known archaeological site! 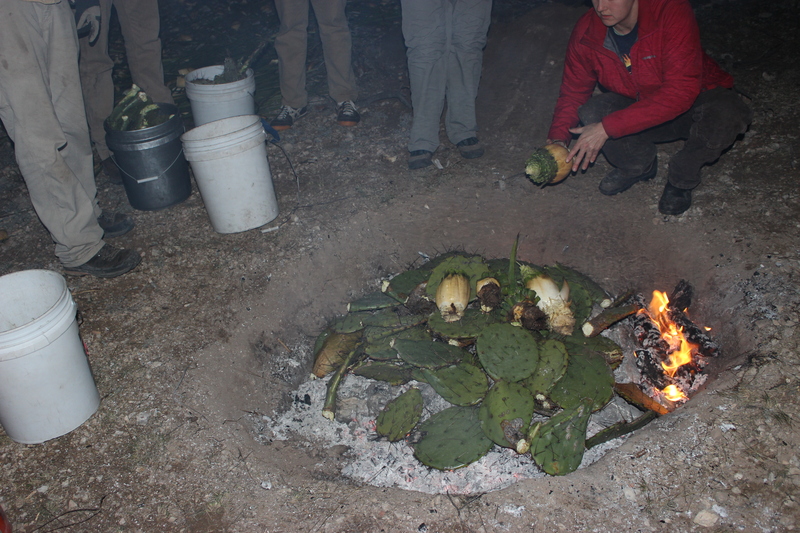 Soil, fuel, and food are the desirable location traits needed for a successful earth oven, because you need soil to dig an oven pit, you need wood to build a fire, and you need food (in our case sotol or lechuguilla) to cook. 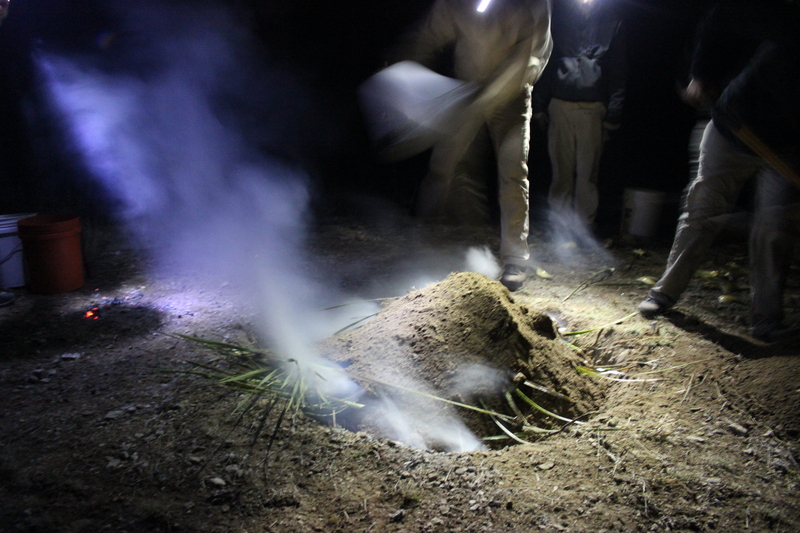 The crew eventually found a favorable spot near campus and cleared the surrounding brush for the ASWT Experimental Earth Oven locality. Unfortunately, due to burn bans, lack of time, and conflicting personal schedules, the 2014 ENC expedition was never able to build an experimental earth oven. Fast forward to this year: On January 11th, three days after the new ASWT interns arrived at the Shumla campus, the weather conditions were highly favorable to finally build our long awaited experimental earth oven. After gathering enough firewood (fuel), lechuguilla and sotol (food), and close to 100 kilograms of limestone clasts from the immediate surroundings, the crew was ready to begin constructing the earth oven. We began by digging a pit close to a meter and a half in diameter, and a half a meter in depth. 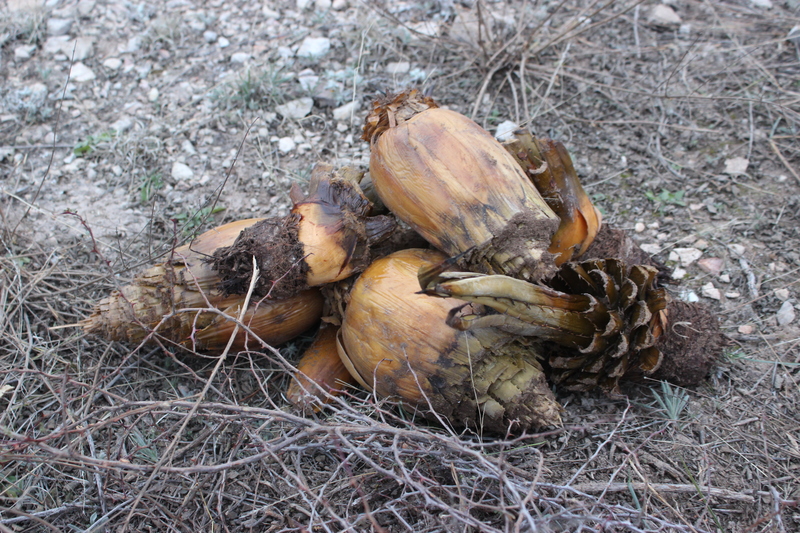 The firewood (hand-gathered deadwood) was then stacked in a conical pyre (similar to a tepee), and the limestone rocks were strategically placed within the cone of firewood. 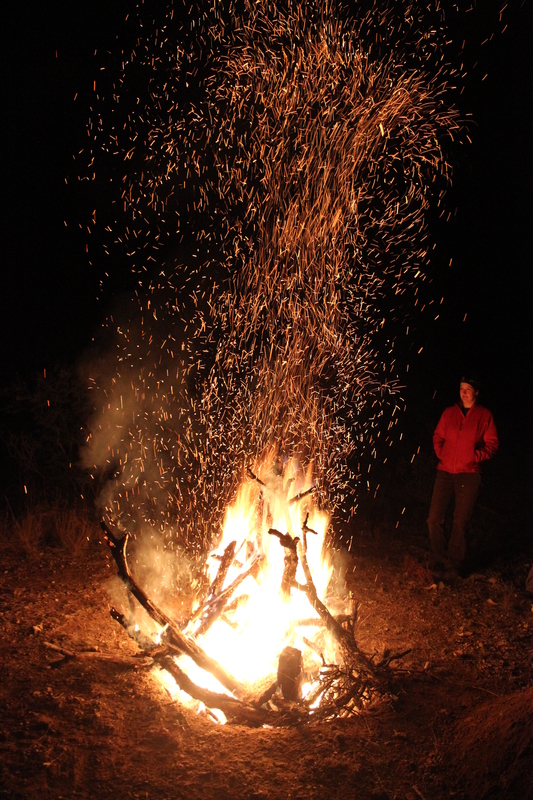 The crew agreed that it was best to light the fire the traditional Lower Pecos way, so Park Archaeologist Jack Johnson of Amistad National Recreation Area (US National Park Service) used the bloom stalk of a sotol plant to start a friction fire. In under 2 minutes, Jack had the fire blazing under the stars (for a time-lapse of the earth oven fire, watch this video by Jack Johnson: https://www.facebook.com/video.php?v=10152425529847134&pnref=story). The blazing conical pyre of firewood and limestone rock in shorty after it was fired. 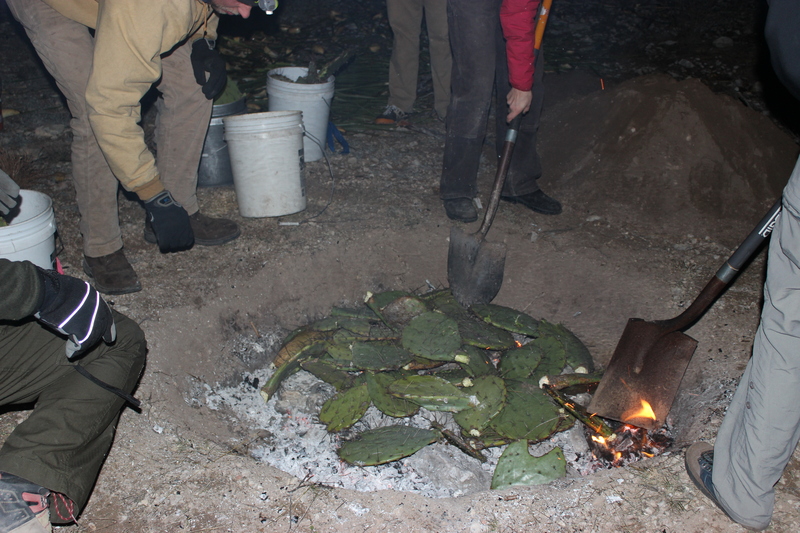 Placing the first layer of packing material (prickly pear pads) ontop of the hot limestone rock. Once the prickly pear was placed, it was time to throw in the food we collected. Lechuguilla and sotol hearts (3 each) were placed in the center of the pit on top of the prickly pear and covered again with more packing material. Laying the food (Sotol and lechuguilla) on top of the packing material. After the remaining packing material was thrown over the food, we began to cover and cap the pit with dirt; this cap of soil insulates and holds in the steamy heat released from the rocks and suffocates the fire allowing no combustion. Now it was time to wait for our plants to bake and hope our hard labor would deliver some tasty results! Capping the earth oven with soil. Charles packing down the cap of soil to ensure no heat escapes. On the evening of January 13th, two days after we capped and sealed our earth oven, the crew returned to taste the baked desert succulents that were slow cooked over the last 48 hours. While digging the bulbs out of the pit, we noticed how the soil was still warm from the heated rocks below. The baked lechuguilla and sotol had a turned a caramelized color and had an aroma that smelled similar to a smokey artichoke. The baked bulbs of sotol and lechuguilla. 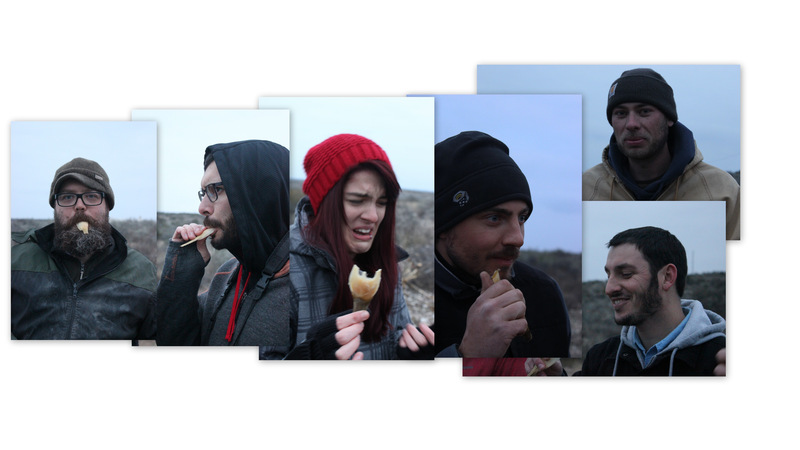 The palatability of these baked plants sent mixed expressions across the faces of our crew, some of who enjoyed the flavor and some who didn’t. Tasting our baked food for the first time. The faces say it all. A great variety of scientific information potentially can be obtained from the experimental construction of earth ovens. One aspect of earth oven use ASWT is particularly interested in is understanding the rate at which limestone rock breaks down through repeated use in earth ovens. The layer of heated limestone rocks forming the bed of an earth oven serves as a thermal storage or heating element that slowly cooks the food. During the firing process, the limestone rocks begin to break apart from the intense heat that they are exposed to (over 500 C). Through reuse, thermal cycling–from cold to hot to cold again– causes the rocks to continue to fracture into ever smaller pieces. Solid rocks with few flaws typically last longer than naturally fractured rocks and those with thin spots. Once the rocks becomes too small to retain heat, they are no longer effective thermal storage devices and they are discarded and tossed into what will become a debris ring around the oven pit, eventually qualifying as a burned rock midden. If we can track and measure a known mass of limestone rock (e.g., 100 kilograms/220 pounds) as it continuously breaks down into smaller rocks from heat and re-used in new earth ovens, we could then to apply this experimental rock-size attribute data to the fire-cracked rock (FCR) that we find in such profusion in the archaeological ground. 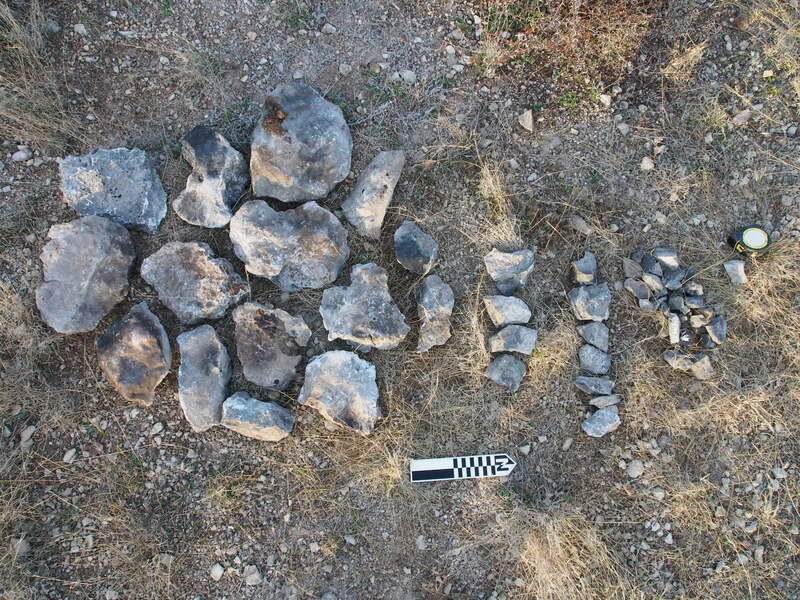 In other words, this experimental use of earth ovens can potentially allow us to more accurately measure the amount of earth oven cooking that took place in Eagle Cave and other rockshelters and open sites in the region. Last week, Emily and Larsen uncovered what we think is an intact earth oven heating element in their excavation unit. To a trained eye, this earth oven feature was characteristically textbook in its makeup. Many of the limestone rocks were inclined at the base of the pit and the soil that surrounded these fire-cracked rocks was heavily organic, ashy, and rich with dime-size charcoal chunks. It even appeared as if there had been a different soil that was used to cap this earth oven once long ago. 3D model (plan view) of feature 8 in Eagle Cave. Notice the dense cluster of fire cracked rock and black/grey charcoal rich soil. Plan and profile view of feature 8 in Eagle Cave. 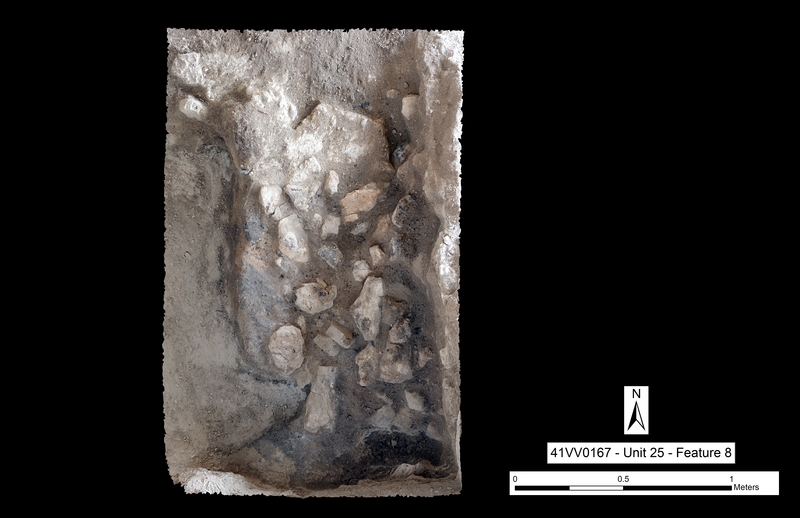 With intact, well-preserved finds such as Feature 8, we have the ability to obtain radiocarbon dates that can help us determine when this oven was used. 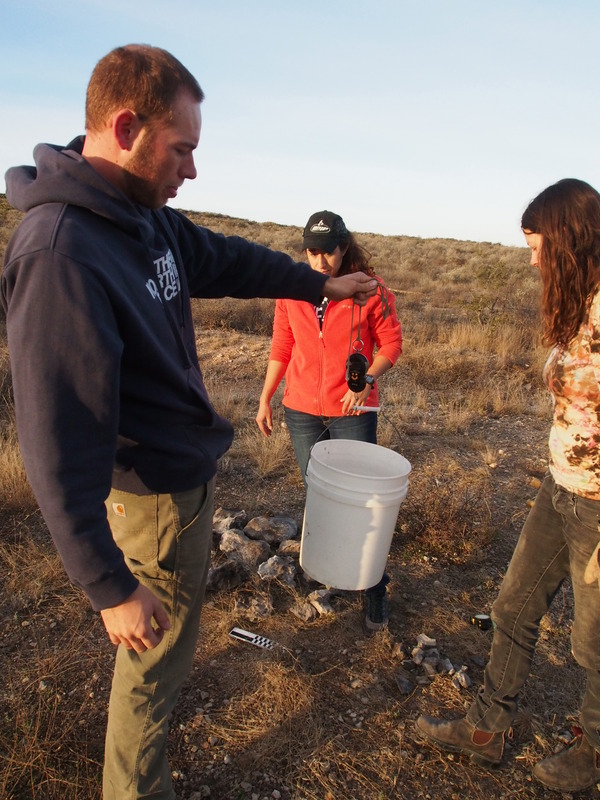 Furthermore, we can sieve the collected soil from that earth oven feature and, with the help of our collaborating archaeobotanists, identify the charred plant remains that were being processed by the people who lived in Eagle Cave. What we cannot do is accurately estimate how many times this earth oven was re-used. Was Feature 8 a one-time earth oven event? Or was it the last of series of earth ovens that had been built and re-used in this very spot using the same rocks? These are some of the questions that ASWT would like to address in our ongoing research. Through these initial tests with EEO No.1 and other experimental earth ovens to follow, we believe that the data to answer these questions could come to light. After enjoying the success of our first experimental earth oven, we returned a week later to dig out all the rocks from EEO No. 1. We used 11 rocks larger than 15 cm in maximum dimension in the oven (99 kg or ~220 lbs of total), and we were able to recover all the rock that was used. Most of the rocks survived the fire, but as you can see from the photograph below, some of the rock broke into smaller fragments. The rock size sorted fire cracked limestone, post earth oven firing. Once all the rocks were pulled out of the oven, we divided the rocks into four size categories: <7.5 cm in maximum dimension, between 7.5-11 cm, 11-15 cm, and >15 cm in maximum dimension. We used the same familiar size categories we use in the recording procedure we call “Rock Sort” which allows us to quantify the rocks from each excavation unit-layer. The smallest two size classes (<7.5cm and 7.5-11cm) contain rocks that are too small to be effectively used again as rocks for the heating element. After counting and weighing all the rocks in each size class, almost all of our rock (93 out of 99 kg) survived to be used again. Weighing the fire cracked limestone rock. Likely during our next session, all the useable limestone rock from ASWT EEO No. 1 will be re-used in another experimental earth oven event. After the second firing (ASWT EEO N0. 2.) we will once again recover all the rocks, sort the rocks into different size categories, and weight all of them. We will continue to re-use the same rocks until the rocks all become too small (<3.5 inches) to effectively retain heat anymore. The more times we “burn” the rocks, the more data we will collect to further our goal. We anticipate great data and results to come! This entry was posted in Eagle Cave, Earth Ovens, Fire Cracked Rock, Spring ENC 2015 Posts. Bookmark the permalink.